It’s that time again! 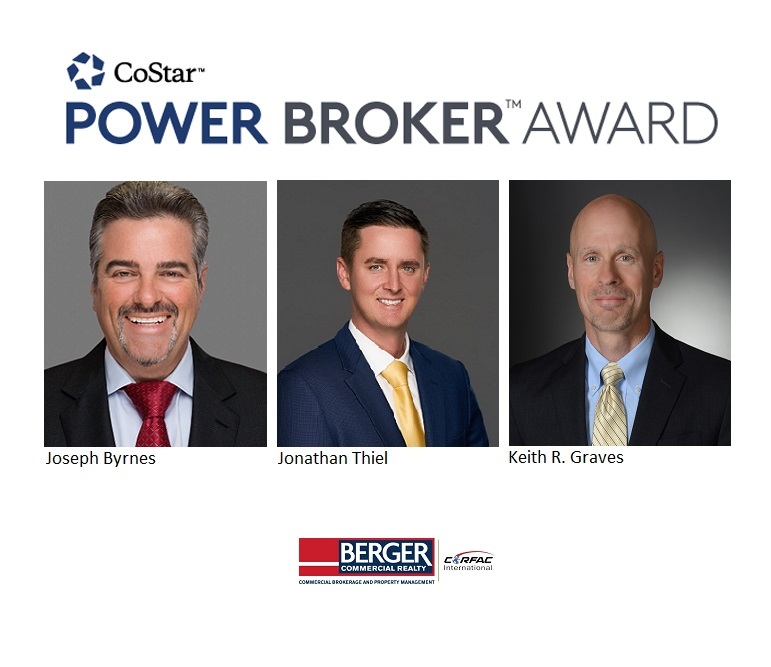 CoStar has revealed the winners of its annual Power Broker Awards, which recognize the firms and individuals who closed the highest transaction volume in their respective markets throughout the previous year. Berger Commercial Realty is no stranger to these awards. In fact, our firm is celebrating its 12th consecutive year as a Top Leasing Firm in the Fort Lauderdale/Broward County market! Additionally, three members of our all-star team received several top broker distinctions. For the fourth consecutive year, Senior Vice President Keith Graves was named Top Industrial Leasing Broker. Senior Vice President Joseph Byrnes received Top Retail Leasing Broker and Top Office Leasing Broker designations and Senior Sales Associate Jonathan Thiel was named Top Office Leasing Broker. In such an active and highly competitive market, Berger Commercial Realty is proud to be distinguished among the top performers in our regional commercial real estate industry. We extend our sincere thanks to CoStar for the recognition and to our esteemed clients for their business and support. Our success as a full-service commercial real estate firm depends on our clients’ satisfaction. By delivering superior customer service and solutions that exceed all expectations, we are able to further our reputation for excellence in commercial real estate and deliver measureable results, which come full circle in recognition by our clients and CoStar alike. We are honored to receive these distinctions and look forward to another year of achievements in 2019.